Whist indulging in a Phuket shopping spree one of the main appeals are the plethora of bargains to be had. Prices for many goods are significantly cheaper in Thailand than in western countries. The best bargains are for Thai produced goods. Prices for imported goods such as electrical items are similar to western prices. Some of the best bargains include clothing, textiles, handicrafts, ceramics, gold, silver, pearls, jewellery, furniture, antiques and art. 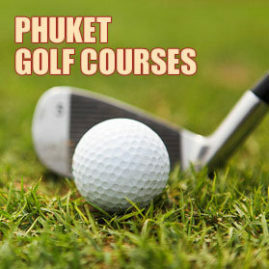 Phuket has a wide range of shopping outlets and a tremendous variety of goods for sale. The best shopping is away from the tourist resorts where you will find much better deals. 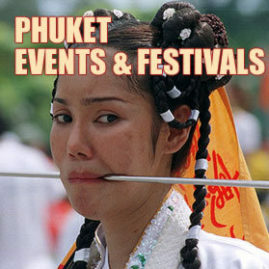 Phuket Town and the surrounding area have the best range of shops with good quality goods for sale at bargain prices. You should shop around to get an idea of the prices for the goods you want. Haggling is an intrinsic part of shopping in Thailand. Remember not to take it seriously - a smile or a joke will get you a lot further. The prices in department stores and supermarkets cannot be haggled. In the independent shops away from the tourist resorts, you can negotiate small discounts. If the goods have marked prices then they are probably already competitive and you will not get a big reduction. Remember if prices are not marked then they will often quote a higher price to foreigners than to Thai customers, so you have more room for negotiation. In the tourist towns, the shops and stalls often set prices much higher than they should be and you can negotiate big discounts and still be paying over the top. If you are not happy with the price then smile and walk away - they will often call you back with a better offer! Fake designer goods and copied CDs are widely available. Recently, the authorities have tried to crack down on this trade and for a while, they were successful. After numerous raids on the beachside stallholders, they seized many millions of baht worth of fake goods and arrested several stallholders. The fake goods briefly disappeared but once the pressure eased, they soon came back. As long as you are aware the goods are fake, then it is your choice whether to purchase. Some of the fakes are good quality while others very poor. If you want the genuine article then you should go to the department stores where the prices will still generally be lower than you would pay at home. You may see the acronym OTOP. It stands for One Tambon One Product. This is a government-sponsored initiative to create small local industries in Thailand. A tambon is the Thai equivalent of a district or parish. The idea of OTOP is to offer every tambon in Thailand the chance to create its own small industry producing a local product and providing employment for local people. The government provides packaging, distribution and marketing assistance. OTOP products are typically local handicrafts, clothing, dried fruits, wines, etc. The quality is usually good and the prices are reasonable although not the cheapest. If you buy OTOP products, you have the satisfaction of knowing you are supporting local industries in Thailand. There is an OTOP market in Patong at the north end of Rat-U-Thit Road behind Holiday Inn although we must say that most of the merchandise sold there is not OTOP. 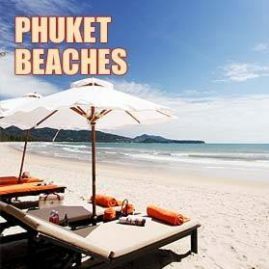 For the first time visitor, the initial introduction to Phuket's shopping opportunities is often the beachside stalls. 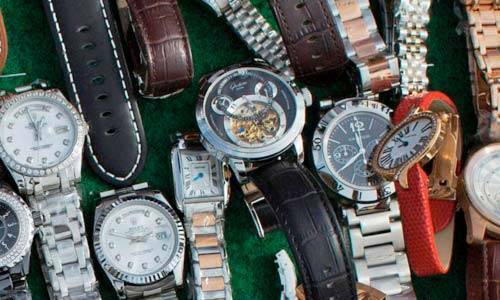 You can find all kinds of trinkets, fake designer labels, copied CDs etc. The first thing to say is this is really not the place to do your shopping. The quality of the goods is variable and the prices are much higher than can be found elsewhere. The beachside stallholders are paying huge rents for their prime locations and of course, they pass this on to their customers. Their opening price may well be triple or quadruple what they are willing to accept. Even if you haggle them down to their bottom price, you can probably find the same product cheaper elsewhere. You can find some good deals in the tourist towns but in general, prices are higher than elsewhere on the island. Land near the beach is very expensive. Rents are therefore expensive and this is passed on to the customer. The further you go from the beach the more likely you are to find good deals. 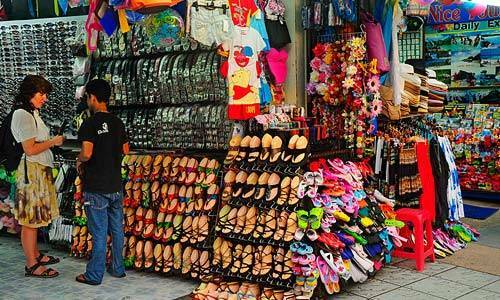 There are many shops and stalls off Rat-U-Thit Road in Patong offering prices lower than the beachfront shops. These prices will seem cheap to most western visitors although in fact they are still high by Thai standards. Ocean Plaza in Bangla Road has some good deals for genuine goods. The easiest places to find good deals are the department stores and supermarkets. The goods have their prices clearly marked and there is no haggling. The prices are good and you can find some real bargains. The shopping malls contain a mixture of chain shops and independents. Most of the independent shops and some of the chains will haggle their prices but not by large amounts. In Phuket Town, on the corner of Tilok Uthit 1 Road and Ong Sim Phai Road, this five-storey department store sells designer clothes and accessories, sports goods, souvenirs, jewelry, toiletries, electrical goods, etc. In fact, just about everything. The prices are a little higher than other outlets but the goods are genuine and good quality. In Phuket Town, almost next door to Robinsons on Tilok Uthit 1 Road is Ocean Shopping Mall. This is a down-market shopping mall where you can find some good quality goods at very reasonable prices. It contains mostly clothing stores but you can also find CDs, souvenirs, toys, telephones and more. The building includes a multiplex cinema which has some English language screenings with Thai subtitles. There is also a ten-pin bowling alley, games arcade, karaoke booths, a children's play area and a few restaurants. In Phuket Town off Ratsada Road, this down-market department store has some of the best prices in Phuket. For clothing and accessories, you will do well to find better prices than here. This new luxury shopping mall is on the outskirts of Phuket Town at the junction between Wichitsongkram Road and Chalermprakiat Road (Bypass Road). Boasting over 250 shops and more than 50 restaurants, it has just about everything you could want under one roof. There is a big department store, a supermarket, food hall and a fantastic variety of shops. Most of the shops are chains selling genuine designer goods. The prices are therefore higher than other shopping malls but still better than you will find in western countries for the same goods. There is a multiplex cinema screening English language movies with Thai subtitles. Originally, there were plans for a ten-pin bowling alley on the top floor but as yet, this has not opened. The only thing Central is really missing is a children's play area. Almost next door to Central Festival on Chalermprakiat Road is Big C. This supermarket and shopping mall chain is French owned. The building contains a large supermarket stocked with a wide range of products. It is hard to beat the prices at the supermarkets. On the bottom floor is a shopping mall which includes a large number of mobile telephone and computer shops. Bus Computer has two shops here and they are one of the best computer repair shops on the island. There is also a food hall and a children's play area. On the top floor are a ten-pin bowling alley and an events hall which usually has some kind of sale such as OTOP, book fairs or furniture. This supermarket and shopping mall is on Chalermprakiat Road north of Big C. The British supermarket chain Tesco has a significant presence in Thailand. The supermarket is big and stocked with a wide range of goods. A wander around the fresh food department is entertainment in itself. Check out the range of tropical fruits, vegetables, seafood and other exotic foods. The supermarket stocks a wide range of other products and all at prices that are hard to beat. There is also a small shopping mall which includes shops, restaurants and a Home Pro DIY store. On the second floor is a food hall, games arcade and children's play area. This furniture store and shopping mall is on Chalermprakiat Road just north of Big C. The top floor is an Index furniture store. It is mass produced furniture and not the sort of produce you would think of exporting from Thailand. Downstairs is a small shopping mall including a nice Thai antiques and handicrafts shop. If you want to try sushi and other Japanese food, there is an Oishi restaurant that does an excellent buffet for 350 baht per person. On Bangla Road in Patong is Ocean Plaza. This small department store and shopping mall is the easiest place to shop in Patong. The prices are reasonable and the goods in the department store are genuine. There are also some restaurants and a small ten-pin bowling alley. shopping - Jung Ceylon is Patong's most up market shopping experience. There are a large variety of shops including a large Big C supermarket (open 10am-10pm), Robinsons Department store, souvenir shops, clothing bargains, restaurants, pubs, the usual fast food outlets and even a decent bookshop. It also has a large entertainment complex and cinema on the top floor which shows the latest movies in English. There is a fountains and lights show every evening at 19:00 and 21:00 and the Millennium hotel is attached. If you are looking for a great selection of places to stay with discount prices, visit Hotel Reservations in Phuket for more information. There is parking underneath but not surprisingly they have started charging to stop people from using it as a parking base for their night out down Bangla Road. 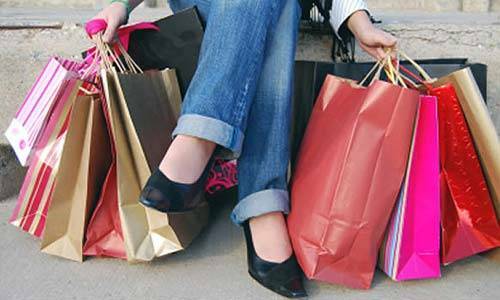 A shopping receipt from one of the major outlets will get a period of free parking and only a small charge for staying beyond the allotted time. There are two large cash and carry stores in Phuket. They are aimed at business owners and residents but anybody can shop there. 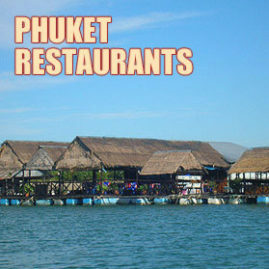 As the name suggests this is the cheapest place to shop in Phuket. It is on Thepkrasattri Road as you are driving out of Phuket Town immediately after an Esso Gasoline Station. It is a huge warehouse stocking just about everything. There is no air-con and the presentation is basic with boxes piled high on shelves. The main savings come from buying in bulk but they also sell most items individually and still at very good prices. They sell such a wide range of produce that you can find may items here that cannot be found elsewhere. The cash and carry chain Makro has recently opened a store in Phuket on Wichitsongkram Road 500 meters before Central Festival. Again, the main savings here come from buying in bulk. They have excellent prices for fresh fruit and veg and also some difficult to find items in the frozen foods section. If you want an authentic Thai shopping experience, you cannot beat a visit to one of the many markets. There are markets everywhere in Phuket. Most of them are selling fresh food such as fruit, vegetables, meat and fish but there are also markets selling clothes and other merchandise. A wander around a Thai market is a colourful and entertaining experience. You will marvel at the extraordinary variety of bizarre foods many of which you will not recognise. shopping - Weekend Market, Phuket TownThis very popular market on the edge of Phuket Town sells a huge range of products. Clothes, accessories, toys, souvenirs, CD's, handicrafts and all kinds of other stuff. It is a relatively new market located on Wai-Rat-Hong-Yuk Road. Drive from Patong to Phuket along Wichitsongkram Road. At the Central Festival traffic lights (Thai Naan restaurant is on the right hand side), turn right. At the next set of traffic lights, turn left. The market is on the right hand side of the road. The market is open Saturday and Sunday from mid afternoon to 10pm. It is worth getting there early as it gets very busy later in the evening. It will take an hour to walk round even if you are not shopping. This market in Phuket Town is a smaller version of its namesake in Bangkok. It is at the east end of Phang Nga Road. It was a lot bigger until the Phuket Town Weekend Market opened and a lot of the stalls moved there. This market only opens on Saturday and Sunday but there are some shops and garden centers that are open every day of the week. This indoor clothes and accessories market is on Tilok Uthit 2 Road near the Thavorn Grand Hotel in Phuket Town. It is one of the best places to get good deals on clothes. On the road outside are more shops selling more clothes and household products. It is open seven days a week. shopping - Downtown MarketThis is the main fresh food market in Phuket. It is located on Ranong Road in Phuket Town. It is open 24 hours a day but the produce available varies depending on the time of day. The best time to shop is actually early morning from 2am to 6am. This is when much of the produce is at its freshest straight from local farms or the airport. Many local restaurant owners and distributors come to do their shopping at this time. On one side of the road is the open-air market selling mostly fruit and veg. On the other side of the road is the indoor market where they sell meat and seafood. The indoor market is looking very rundown and you may well see a few rats around. There are plans to rebuild the whole area in which case they will move the market to King Rama IX Park while the work takes place. Patong Market - in a new building behind Jung Ceylon. Kathu Market - out of Patong on to Wichitsongkram Road and turn left at the lights. Cape Panwa - drive south along Sakdidet Road and turn right at the third set of traffic lights. Cherng Talay - in Cherng Talay village near Bang Tao beach. You can find good deals on gold, silver, gems, pearls and other jewelry. 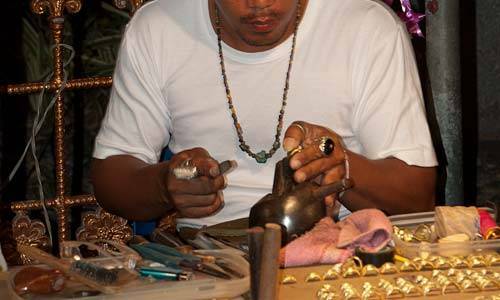 Thailand is a world centre in the jewelry trade and you can find items considerably cheaper than at home. Silver is an especially good buy. It really helps if you know a little bit about what you are buying but if not your best bet is to shop around and get an idea of the prices. If you are thinking about reselling back home you should know that it will be difficult to make a significant profit. You should avoid the shops in Patong. 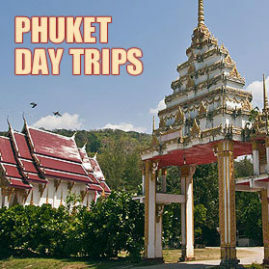 There are also several tourist trap shops around Phuket that get most of their customers from tour companies and by paying commission to tuk-tuk drivers. If your tuk-tuk driver takes you to a shop you did not ask to visit then it is because they will pay him commission. You will not get a good deal from such shops and should not buy anything. There are good jewelry shops on Montri Road in Phuket Town and more around Ratsada Road and Ranong Road. 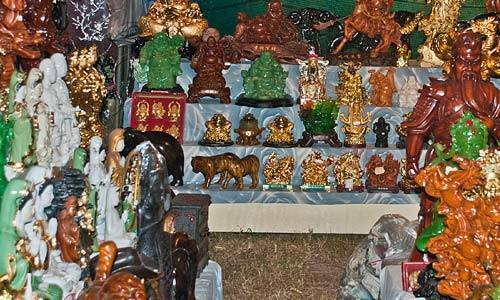 You need a permit to export Buddha images or genuine antiques from Thailand. You need to contact the Thai government's Fine Arts Department. The easiest way to do this in Phuket is to go to the Thalang National Museum who can advise you if the item may be exported and arrange the necessary paperwork. The best area for antiques and art shops is the old town area of Phuket Town. If you wander around the old streets of Dibuk Road and Thalang Road, you will find many interesting antique and art shops. It is also a chance to admire the Sino-Portuguese architecture of the oldest buildings in Phuket Town. If you are a resident or interested in exporting furniture back home then you can find good deals on handcrafted furniture. Teak is an especially good deal. The best deals for teak are in northern Thailand where it grows naturally but if you are not visiting the north then you can still get good deals in Phuket. There are some good furniture shops on Thepkrasattri Road just north of the junction with Bypass Road. Thai silk is one of the best buys whether sold by the meter or as ready-made garments. 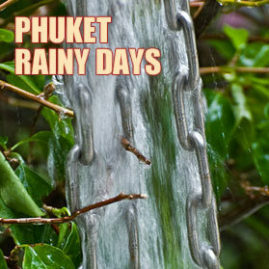 It is available all over Phuket. The quality varies widely but the best cloth is absolutely beautiful. You can buy good quality silk at Robinsons or Central department stores. There are many cloth shops around Phuket Town including a good selection along Thalang Road. Lower quality Thai Silk is available around the markets and souvenir shops.